As the boundaries of harvesting wind energy expand to meet the ever-increasing societal energy demands, the number and size of wind turbines being constructed rises. As part of a larger project to monitor sound in an operating wind park in western New York State, a cross-sectional survey was conducted among individuals living in and around the wind park to characterize the perception, level of annoyance, and self-reported health effects of residents. We conducted the study in a 126 MW wind park consisting of 84 turbines spanning approximately 19 square miles of farmland. Short-term outdoor and indoor sound level measurements were also performed at each dwelling in which a questionnaire was administered. To our knowledge, this study is the first to collect sound measurements at individual residences. There was no apparent exposure-response relationship between an individual's level of annoyance and the short duration sound measurements collected at the time of the survey. There was a correlation between an individual's concern regarding health effects and the prevalence of sleep disturbance and stress among the study population. The siting process is unique to each community with varying degrees of success. Additional sound level measurements inside and outside homes in larger cohorts in concert with detailed questionnaires would be useful in verifying those exposure-response relationships found in studies using calculated sound level data. Additional research should include a detailed investigation of sleep patterns and possible disturbance in those living in and near operating wind turbine projects. The literature regarding reported annoyance or complaints due to wind turbine noise is sparse. Our study utilized a questionnaire in conjunction with short-term sound measurements collected at residences in proximity to an operating wind project to determine the nature of the association between the short-term measurements and questionnaire results. This was part of a larger study in which extended noise monitoring was conducted at five receptor locations within the wind park, and two locations removed from the wind park to provide comparison "no turbine" measurements over three 4-day campaigns. These data are reviewed in detail in a separate publication. To the best of our knowledge, this project is the first comprehensive evaluation of wind turbine-related sound in New York State and the first to incorporate short-term residential noise measurements. Gaining an understanding of the factorss that may influence public perception near wind projects is the first step in developing strategies to mitigate these factors if warranted. A large, 126 megawatt (MW), recently-constructed (2009) Wind Turbine Park in Western New York State (Wethersfield, NY) was selected for the study. The wind park employs 84, 1.5 MW General Electric model 1.5sle turbines spanning approximately 19 square miles of rural farmland. Each turbine has a hub height of 80 meters (m) and a rotor diameter of 77 m. This model of turbine has a published maximum sound power wind speed of 9 meters per second ( m/s) at hub height, above which noise output does not increase. According to the manufacturer,  this is equivalent to a maximum sound power wind speed of approximately 7 m/s at a standardized 10 m height (assuming a logarithmic wind profile with characteristic roughness of 0.03 m). Institutional Review Board (IRB) review of the survey protocol and the instrument was sought from Fox Commercial IRB, Limited, Springfield, IL to ensure that the participation of human subjects in this study was in compliance with applicable standards of care. Based on their review of the project, an exemption from IRB oversight was granted. A cross-sectional study was conducted among individuals living in the wind park. A questionnaire was developed to assess the perception and prevalence of annoyance associated with living in close proximity to wind turbines, along with a limited set of questions regarding health effects potentially related to the wind turbines. The survey was primarily adapted from that developed by Pedersen and Waye  The response to wind turbine noise was measured using seven different questions. The internal consistency of these questions was assessed using Cronbach's alpha. The alpha for these seven questions was 0.92, ensuring high internal consistency. Surveys were administered in person by two field personnel to residents living within 28 square miles encompassing the 14 square miles of the wind park area during October and November 2011. Residents were provided a brief summary of the project, along with project contact information and asked if they would like to participate. Sound level measurements were collected inside and outside the survey respondents' homes at the time of the survey. Indoor measurements were conducted with doors and windows closed. Residents were asked to turn off any indoor sources of noise, including televisions, radios, fans, and electric heating units. Certain appliances including refrigerators and heating systems, along with pets, young children, and general movement inside contributed to the indoor noise during the 10-min noise measurements. The outdoor and indoor SPL measurements were logged on a 1-min interval continuously for approximately 10 min, using the Larson Davis Model 831 sound level meter with Class-1 random incidence prepolarized condenser microphone (50 mV/Pa nominal sensitivity), preamplifier (PRM831), and a one-third octave band analyzer filter set. After correcting for windscreen attenuation,  the one-third-octave band spectral Leq values were summed into three wide bands: An un-weighted Leq including 6.3 Hertz (Hz) through 16 Hz (representing an infrasound range), an un-weighted Leq including 20 Hz through 250 Hz (representing a low-frequency range), and an A-weighted LAeq including 6.3 Hz through 3150 Hz (a broadband A-weighted range). The Leq, or A-weighted Leq (LAeq), are used to describe the equivalent continuous level, which can be better thought of as an average level, for a certain period of time. At the time of the questionnaire deployment, the number of turbines visible from the resident's home (360° view) was noted regardless of distance and compass direction. All statistical analyses were performed using IBM's SPSS Version 11 software. Correlations between variables were calculated using Spearman's rank test. Differences between proportions were tested using a z-test for proportions. Verbal rating scale data and noise measurements were treated as continuous variables. Linear regression was used to explore the various environmental factors and measured SPLs on predicting an individual's satisfaction with their living environment. All statistical tests were two-sided and P values were compared with either 0.05 or 0.01 to determine statistical significance. To avoid the risk of mass significance, the P values were compared with 0.01 in select analyses where noted. Fifty-six homes were randomly visited out of a possible 256 homes within the Wethersfield wind park. The two field interviewers were refused at a total of four homes. Of the 52 homes where surveys were collected, 51 were collected from 51 homes, three were collected from one home and two were collected from four homes. Of the 62 individuals interviewed, no one worked directly for the operator or had a relative that did, and 46 reported no association with the operator. Of the 16 that reported an association, ten owned land with a wind turbine on their property, one received an undisclosed fee for a neighbor easement and five noted some other arrangement, but refused to supply any details. With an average wind speed of 1.7 m/s at microphone height during the outdoor noise measurements, the wind speeds were below the wind speeds typically present in the turbine park. The demographics of the survey population are outlined in [Table 1]. Of the 62 participants, 35 were men and 27 were women. The average age of all participants was 51 ± 15.2 years, with no statistically significant difference in age among men and women. At the time the questionnaires were administered, the average number of turbines visible was 19 ± 16. The visible count was conducted during the fall when all foliage had fallen, exposing the maximum number of visible turbines. The sound measurements collected in each frequency band are summarized in [Table S-1, Supplemental Material] [Additional file 1]. 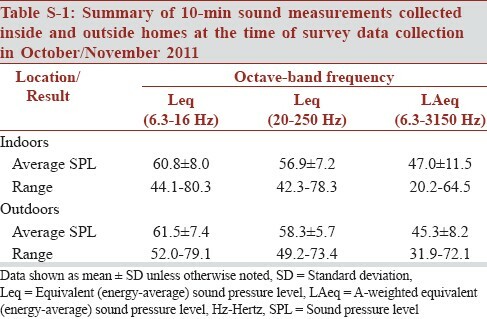 The arithmetic means for outdoor SPL measurements for the "infra" (6.3 Hz to 16 Hz) and "low" (20 Hz to 250 Hz) frequency bands were greater than the indoor measurements at those same frequency bands. However, the indoor A-weighted "overall" frequency range (6.3 Hz to 3150 Hz) was 1.7 dBA greater than the average outdoor measurements. Individuals' general opinions on their living environment and wind turbines were solicited [Table 2]. The large majority of study participants, 90%, were either very satisfied or satisfied with their living environment. Overall, 44% of individuals had a positive or very positive general opinion of wind turbines, while 34% had a negative or very negative view. 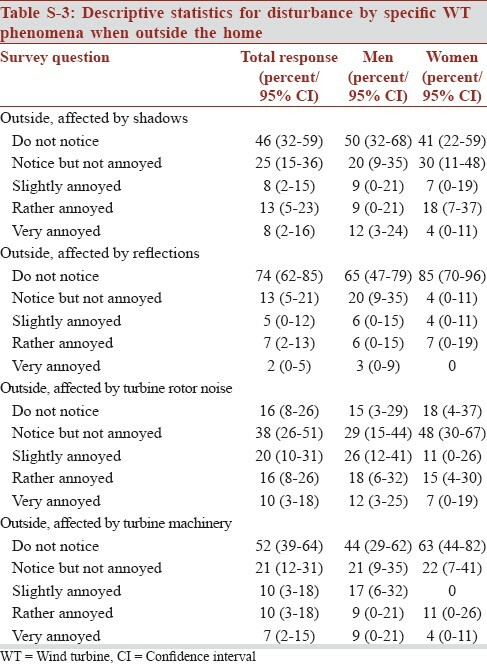 The majority (73%) of individuals either did not notice, or noticed but were not annoyed by the altered view when outside. 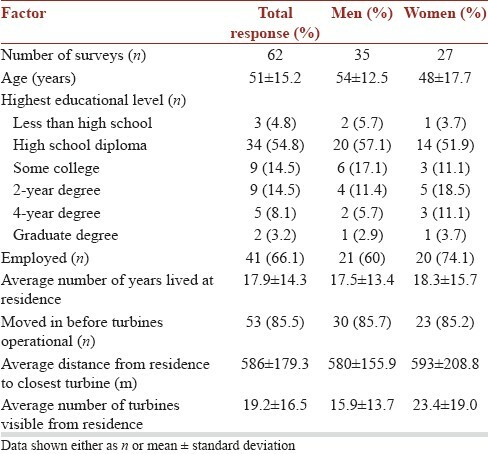 There were no statistically significant differences between the proportions of responses among men and women for any of the questions presented in [Table 2]. Participants were asked to characterize the type of sound emanating from the turbines [Table S-2, Supplemental Material] [Additional file 2]. While indoors, the large majority of individuals did not notice, or noticed but were not annoyed by the various qualities of sound from the wind turbines except for the sound characterized as swishing. This subjective sound descriptor was significantly negatively correlated with an individual's level of satisfaction with their living environment. There were several individuals who experienced some level of annoyance with low frequency sound emanating from the turbines, and this characteristic was also statistically significantly negatively correlated with their satisfaction with their living environment. The majority of individuals were not affected by shadows formed by wind turbines or reflections either when inside or outside their homes [Table S-3 [Additional file 3] and Table S-4 [Additional file 4], Supplemental Material]. 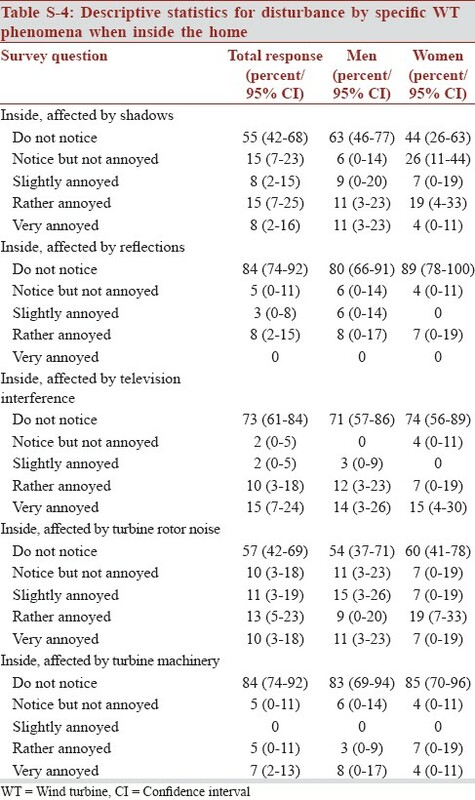 For those who reported annoyance from wind turbines and wind turbine phenomena, 60% of individuals were affected a few times per week or daily by noise, 92% by television or radio interference, and 54% by shadows or reflections [Table S-5, Supplemental Material] [Additional file 5]. The majority of individuals felt the turbines were more clearly heard when the wind blew from the direction of the turbines toward their homes (58%), when the wind was rather strong (66%) and during a particular season (56%) [Table S-6, Supplemental Material] [Additional file 6]. The correlations between the sound level measurements collected inside and outside the home at the time of the survey and two satisfaction measures were explored using Spearman's rank [Table S-7, Supplemental Material] [Additional file 7]. 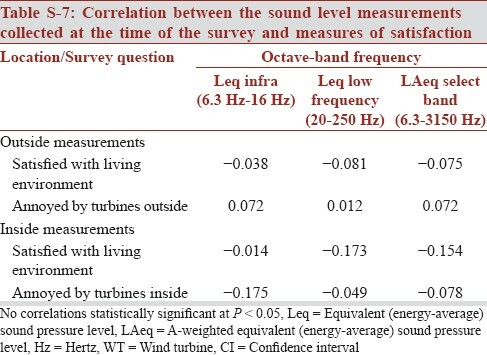 There were no statistically significant associations between the sound level measurements collected either inside or outside, and an individual's assessment of their satisfaction with their living environment and their annoyance level with the turbines at the P < 0.05 level. Another measure of noise sensitivity and general satisfaction with one's living environment for the study population is captured in the number of noise complaints participants lodged with the Town of Wethersfield. Of the 62 individuals interviewed, nine had issued complaints. Six individuals representing five households indicated that they issued the complaint in response to wind turbine noise. This represents a complaint rate for the study population of 8% if calculated by home, and 10% if calculated per person. The outdoor low frequency band measurements outside the home, using Spearman's rank, were correlated with participant's description of the sound as resounding [Table S-8, Supplemental Material] [Additional file 8]. Indoors there were three statistically significant correlations (P < 0.01) between the participant's description of noise as pulsing or throbbing, and the three noise bands monitored. The correlations of the various survey questions with the main dependent variable being the level of satisfaction with the participant's living environment were calculated using Spearman's rank. Additionally, secondary dependent variables were identified as an annoyance with wind turbine noise both inside and outside the home. The correlations between these three dependent variables with other subjective survey answers, demographic variables, and monitored noise levels are summarized in [Table 3]. To address the risk of mass significance, P < 0.01 were considered statistically significant. An individual's satisfaction with their living environment was statistically significantly correlated with their general opinion on wind turbines, their opinion on the altered views created by wind turbines and their sensitivity to noise in general, as assessed by a single question asking them about their sensitivity to environmental noise in a suite of questions asking about other potentially annoying environmental factors including air pollution, odors and littering. Interestingly, none of the indoor or outdoor SPL measurements collected at the time of the survey was significantly correlated with any of these variables. 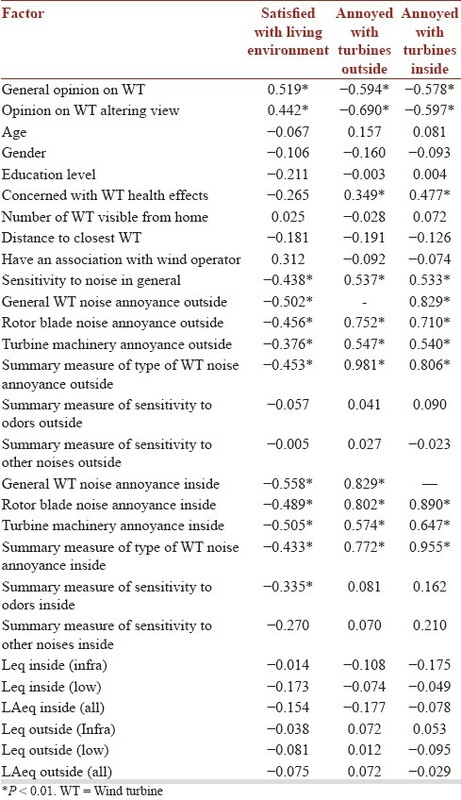 Similar to the satisfaction with the living environment, general annoyance from wind turbine noise was statistically correlated with an individual's general opinion on wind turbines, their opinion on altered landscapes, their concern over health effects associated with the wind turbines and their sensitivity to noise in general. As with the level of satisfaction variable, none of the indoor or outdoor SPL measurements collected at the time of the survey were correlated with participants' general noise annoyance with wind turbines inside or outside. Regression models exploring an individual's level of satisfaction with their living environment were created [Table 4]. Covariates included general opinions on wind turbines, opinions on altered views, whether the respondent had any sort of relationship with the operator, and specific types of noise. An individual's general opinion on wind turbines was highly predictive of their individual satisfaction with their living environment (Model 1). With both opinion on wind turbines and opinion on altered landscape in a model together, the former covariate remained statistically significant. When looking at models that distinguish rotor blade noise from turbine machinery noise both inside and outside, individuals appeared to be most negatively impacted by turbine machinery noise inside the home. Using Model 7, the effect of whether an individual had an association with the operator was investigated. There was a statistically significant association between an individual's satisfaction with their living environment and if they had some type of relationship with the energy company. Using Model 7 as a core, the effects of other covariates on an individual's level of satisfaction with their living environment were explored, including: their concern with health effects, age, education level, gender, number of visible wind turbines, and distance to the closest wind turbine from the home. None of these covariates reached statistical significance (data not shown). Using the base model presented above [Model 7 in [Table 4] to predict an individual's level of satisfaction with their living environment, additional models using the sound level measurements collected inside and outside participants homes were also generated [Table S-9, Supplemental Material] [Additional file 9]. None of the sound level measurement coefficients reached statistical significance. Additional models, building on Model 3 in Table S-9, were investigated to determine the predictability of other covariates including whether respondents were concerned with health effects, age, education level, gender, number of visible wind turbines from home, and distance to the closest wind turbine. None of these covariates reached statistical significance. Questions regarding participants' concerns over health effects related to living near wind turbines were explored, and details regarding specific symptoms solicited [Table 5]. The large majority of participants (80%) were not concerned about experiencing health effects as a result of living in close proximity to wind turbines. There were 12 participants, however, that were concerned. Sleep disturbances were experienced by 26% of respondents surveyed. There were no statistically significant differences between the proportions of responses among men and women for any of the questions presented in [Table 5]. 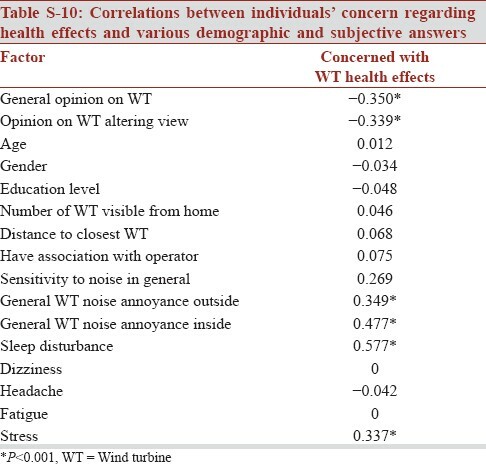 An individual's concern regarding health effects was statistically significantly correlated with their general opinion on wind turbines, their opinions on the altered landscapes, their sensitivity to noise in general, and both their general annoyance with wind turbines both inside and outside [Table S-10, Supplemental Material] [Additional file 10]. In addition, the association between general concern over health effects and sleep disturbance and stress were statistically significantly correlated at P < 0.01. 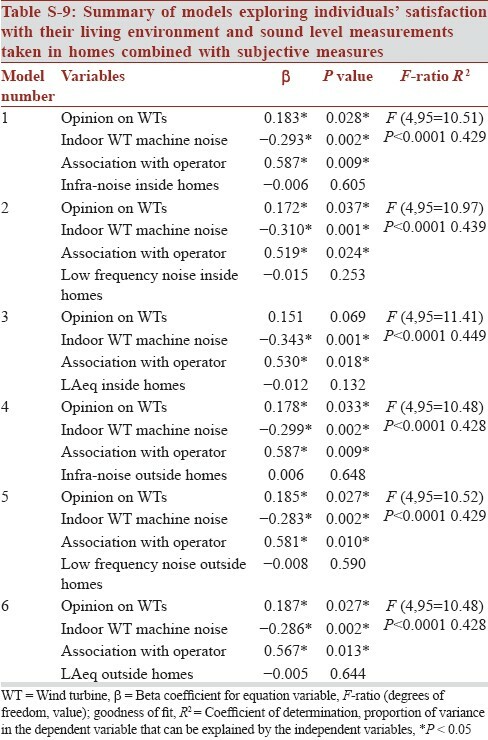 The relationships between the sound level measurements collected at the homes and an individual's concern regarding wind turbine-related health effects are shown in [Table S-11, Supplemental Material] [Additional file 11]. 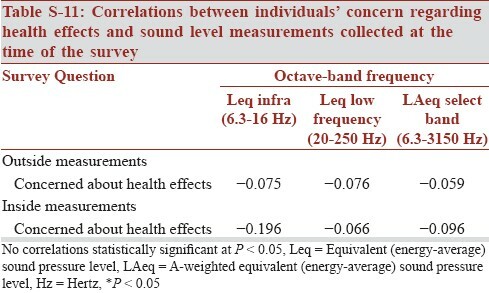 There were no statistically significant correlations between the indoor and outdoor noise measurements and an individual's level of concern regarding experiencing health effects at the P < 0.05 level. There were no statistically significant correlations between age or gender and a participant's perceived level of satisfaction with their living environment, their general opinions on wind turbines, their opinions on the altered landscape or whether they are annoyed by wind turbine noise either outside or inside. This is consistent with the findings of Pedersen et al. in The Netherlands and with Pedersen and Persson Waye's  study in Sweden where they note that the odds of being annoyed was not significantly correlated with gender. As indicated previously, a high percentage of study participants were overall either very satisfied or satisfied with their living environment. All individuals were receiving a substantial property tax reduction as a result of the turbine project, along with other benefits including free trash removal. 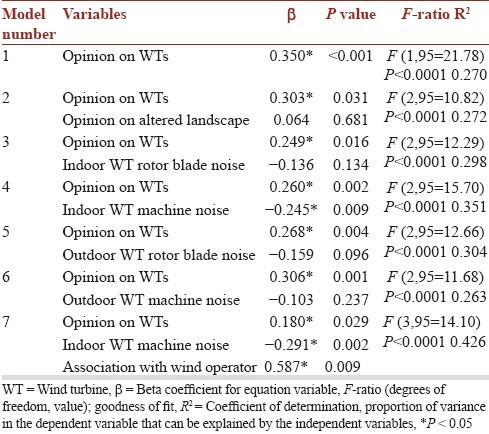 Among those individuals in our study that were benefiting economically from the wind turbines by a direct arrangement with the operator, they were overall more likely to be satisfied with their living environment, but not necessarily more likely to be less annoyed with wind turbine noise outside or inside their homes. This is somewhat in contrast to studies conducted in The Netherlands  where study participants were less likely to be annoyed by wind turbine noise if they were receiving economic benefit from them. This relationship was not discussed in the Swedish study  where the majority (95%) of the study population was not benefiting economically from the wind turbines. Interestingly, there was no correlation between either an individual's level of satisfaction with their living environment, or their annoyance with wind turbine noise inside or outside, and the number of turbines visible from their home. This is in contrast with Pedersen et al.,  who noted a significant increase in the proportion of those who were annoyed by the sound from the wind turbines if they could see at least one turbine from their home. This study did include a fair number (27% in rural areas and 46% in built up areas) of participants that could not see any wind turbines from their property. This is in contrast to our study, where all participants could see at least one, and on average 19 wind turbines, from their homes. Furthermore, the average distance from turbine to each surveyed household was >580 m. O'Neal et al. concluded that wind turbine infrasound is inaudible to even the most sensitive people at distances of greater than around 305 m.
The results of this study suggest that an individual's level of satisfaction with their living environment does not depend upon the noise levels sampled inside and outside their homes. This is in contrast with those results presented by Pedersen et al. in both their Dutch  and Swedish , cohorts where they found statistically significant exposure-response relationships between annoyance and calculated A-weighted SPLs at individual residences. Although these modeled sound levels do correlate well with long-term turbine noise exposure levels, individual data points can vary significantly from the long-term trend. Since the current study sampled only a single 10-min period at each residence, the expected scatter in these values about the long-term trend makes comparison with prior findings difficult. To our knowledge, this study is the first to collect actual sound measurements at individual residences. In contrast to actual sound monitoring, various models were used in the European studies to calculate A-weighted SPLs at the residences of survey respondents, including the sound propagation model for wind power plants adopted by the Swedish Environmental Protection Agency,  The Netherlands regulatory required models,  the New Zealand Standard  and the International Standards Organization. If one assumes that the misclassification of sound exposure inherent in these models is random, the exposure-response relationship they have reported may in fact be stronger in reality, as random misclassification of exposure will bias results towards the null. All three studies were considerably larger than this study of 63 individuals, with 725 participants in The Netherlands and 754 and 351 participants in each of the Swedish studies. All three European studies included both rural and urban settings with varied terrain, while this study was conducted completely in a rural farming community. Albeit internally valid, the small sample size and the uniformity of the study area where everyone is benefiting in some way, may make these study results somewhat less generalizable to all types of communities in proximity to wind turbines. Interestingly, and somewhat counter intuitively, Pedersen et al. did note a difference in the rural versus urban/built up response, whereby those individuals living in a built up urban environment tended to be more annoyed by the wind turbine noise than those in a rural environment without a main road. This is generally predictive of the findings of this study. In contrast, Pedersen et al. noted that those individuals living in rural environments were more likely to be annoyed by wind turbine noise than those living in suburban environments. Another factor that may have limited this study's ability to see an exposure-response relationship was the relatively short duration of sound measurements collected (10-min samples). This sample may not be representative of the overall sound profile in or outside the home; this can be seen in the long-term monitoring results, where the scatter of measured values varied significantly about the long-term trend. Furthermore, there was some variation in the time of day the participants were surveyed, which would likely affect the indoor measurements. It is also quite likely that in this small community, the strong relationship between a participant's general opinion on wind turbines and the general high level of satisfaction with their living environment overwhelms any exposure-response relationship that may exist between satisfaction, annoyance and actual sound level measurements. The short-term noise measurements at questionnaire survey locations obtained in this study could be supplemented with a site-wide theoretical model of turbine sound power and noise propagation, as has been used in prior epidemiological studies. A calculated noise immission value for each residence may characterize long-term average exposure better than short-term field measurements, and therefore may also provide better insight into resident satisfaction and annoyance from turbine noise. Finally, this study did not include the very fine time resolution (<1 s) needed to characterize amplitude modulation, "thumping," or other time-domain characteristics that are sometimes associated with wind turbine noise. There are few reports in the popular and peer reviewed literature examining the potential association of living in close proximity to wind turbines with the development of various health effects including acute and chronic conditions. This study did not investigate the association between noise exposure from the turbines and chronic diseases such as hypertension, diabetes and ischemic heart disease. It should be noted that the questionnaire asked only about self-reported health effects; no medical records were reviewed. A relatively small percentage of this study population (20%) was concerned about health effects associated with living in close proximity to the wind turbines. Among these 20%, only two subjects felt strongly enough about their symptoms to seek medical attention. In both cases, the participants indicated that their physicians noted the wind turbines as the cause of their conditions, with one individual being prescribed medication for their condition. The percentage of individuals reporting they are concerned with health effects (20%) in this study is also consistent with the percentages of individuals reporting headaches (19%), fatigue (18%) and to a lesser extent stress (11%). Further, most of those concerned about health effects felt that any symptoms they were experiencing were, in fact, related to the wind turbines (18%) and were worse since they became operational (19%). These factors were not discussed in the Swedish and Dutch studies previously published. 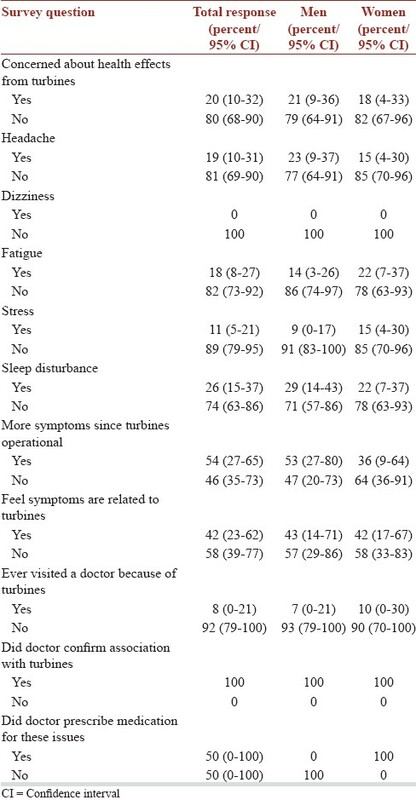 Interestingly, more individuals (26%) reported sleep disturbance from the wind turbines, than reported they are generally concerned about health effects from the wind turbines. This is consistent with the 23% of respondents that stated they were "disturbed in their sleep by noise" in Pedersen et al. 2004 Swedish study. Pedersen et al. also noted that among those who were annoyed by wind turbine noise, 36% reported that their sleep was disturbed by a noise source in an open question, not necessarily a wind turbine. In their earlier 2004 study of 351 Swedish residents, they noted that "the number of respondents disturbed in their sleep was too small for meaningful statistical analysis, but the probability of sleep disturbances due to wind turbine noise cannot be neglected at this stage." This study did reveal a statistically significant correlation between an individual's concern regarding health effects and having experienced sleep disturbances. In addition to a correlation with sleep disturbance, stress was also significantly correlated with those individuals concerned regarding health effects. Similar to that reported by Pedersen et al.,  this study did not report any significant correlations with self-reported headaches, dizziness or fatigue and the sound level measurements collected at the time of the survey. In general, a larger sample size would be ideal to have more resolution and power to detect annoyance within this community. Recent work in the literature would indicate that additional, more detailed questions regarding sleep disturbance could be beneficial when surveying wind turbine-impacted communities. Our short-term outdoor and indoor sound level measurements, collected at each home surveyed, did not reveal an exposure-response relationship with an individual's level of annoyance. There was a correlation between an individual's concern regarding health effects and the prevalence of sleep disturbance and stress among the study population however. Additional sound level measurements inside and outside homes in larger cohorts in concert with detailed questionnaires would be useful in verifying those exposure-response relationships found in studies using calculated sound level data. Additional research should include a detailed investigation of sleep patterns and possible disturbance in those living in and near operating wind turbine projects. 1. Pedersen E. Noise Annoyance from Wind Turbines - A Review. Prepared for the Swedish Environmental Protection Agency; 2003. 2. Chatham-Kent Public Health Unit. The Health Impact of Wind Turbines: A Review of the Current White, Grey, and Published Literature; 2008. 3. AWEA/CanWEA. Wind Turbine Sound and Health Effects: An Expert Panel Review; http://canwea.ca/pdf/talkwind/Wind_Turbine_Sound_and_Health_Effects.pdf. 2009. 4. Massachusetts Department of Environmental Protection. Wind Turbine Health Impact Study: Report of Independent Expert Panel; http://www.mass.gov/eea/docs/dep/energy/wind/turbine-impact-study.pdf. 2012. 5. Farboud A, Crunkhorn R, Trinidade A. ′Wind turbine syndrome′: Fact or fiction? J Laryngol Otol 2013;127:222-6. 6. Pedersen E, Waye KP. Perception and annoyance due to wind turbine noise - A dose-response relationship. J Acoust Soc Am 2004;116:3460-70. 7. Pedersen E, Persson Waye K. Wind turbine noise, annoyance and self-reported health and well-being in different living environments. Occup Environ Med 2007;64:480-6. 8. Pedersen E, van den Berg F, Bakker R, Bouma J. Response to noise from modern wind farms in The Netherlands. J Acoust Soc Am 2009;126:634-43. 9. Pawlaczyk-Luszczynska M, Dudarewicz A, Zaborowski K, Zamojska M, and Waszkowska M. Assessment of annoyance due to wind turbine noise. J Acoust Soc Am 2013;133:3450. 10. Bolin K, Bluhm G, Eriksson G, and Nilsson M. Infrasound and low frequency noise from wind turbines: exposure and health effects. Environ Res Lett 2011;6:1-6. 11. Nissenbaum MA, Aramini JJ, Hanning CD. Effects of industrial wind turbine noise on sleep and health. Noise Health 2012;14:237-43. 12. Knopper LD, Ollson CA. Health effects and wind turbines: A review of the literature. Environ Health 2011;10:78. 13. GE Wind Energy GmbH. Technical Documentation, Wind Turbine Generator System GE 1.5sl/sle 50 & 60 Hz, Noise Emission Characteristics - Normal Operation According to IEC; 2005. 14. Hessler GF, Hessler DM, Brandstatt P, Karlheinz B. Experimental study to determine wind-induced noise and windscreen attenuation effects on microphone response for environmental wind turbine and other applications. Noise Control Eng J 2008;56:300-9. 15. O′Neal R, Hellweg Jr R, Lampeter R. Low frequency noise and infrasound from wind turbines. Noise Control Eng J 2011;59:135-57. 16. Hessler GF, Hessler DM. Recommended noise level design goals and limits at residential receptors for wind turbine developments in the United States. Noise Control Eng 2011;59:94-104. 17. Current Authors. Evaluation of Wind Turbine-Related Noise in Western New York State. Submitted for Publication; 2013. 18. VROM. Halndleiding Meten en Rekenen Insturielawaii (Manual for Measuring and Calculating Industrial Noise). den Haag, The Netherlands: Ministerie van Volkshuisvesting, Ruimtelijke Ordening en Milieubeheer; 1999. 19. NZS. The Assessment and Measurement of Sound from Wind Generators. New Zealand Standard 6808, 1998. Wellington, New Zealand: Standards Council of New Zealand; 1998. 20. ISO. Attenuation of Sound during Propagation Outdoors. Part 2: General Method of Calculation. ISO 9613-2. Geneva: International Organization for Standardization; 1996.